Susan started at CGCC in August, 2000 as the adult literacy coordinator and helped to establish what is now Gorge Literacy. Shortly thereafter, she expanded her responsibilities by joining the Pre-College department, teaching reading, writing and math. She has enjoyed her time with students inside and outside the classroom and appreciates the opportunity to share and learn together. 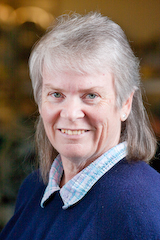 Currently, Susan manages the CGCC Curriculum Office, providing support to the Curriculum Committee, faculty and staff in the development and maintenance of courses, certificates and degrees. In addition, she provides direction for academic and institutional assessment, institutional/strategic planning, as well as accreditation compliance and reporting. Susan enjoys the fact that she has an eclectic job in which she is fortunate to explore different areas of the education arena. So in addition to her curriculum and assessment work, she also can be found organizing a variety of co-curricular activities which have included over the years: the Spring Humanities Series, the Science Summit, guest authors, music and theatrical events, and on- and off-campus art shows. Away from CGCC, she is obsessed with hitting fuzzy green balls around the tennis court, and she invites you to "Serve 'em up!"